“Alejandra, Mother NaturAle, made my pregnancy and birth experience of my third child unforgettable. Often, a pregnancy can go by so quickly because you are anticipating your child’s arrival and cannot wait for the day you are a parent to a precious new life. Alejandra helped me to relish in all the aspects of pregnancy to postpartum. She captured my journey through beautiful pregnancy photographs and birth photographs. As my doula she always knew when to check up on me and the simple phone calls that showed she was thinking of me and my experience. On the day of my labor, she was a calm and gentle friend by my side. I felt her supporting me and helping me to reach my inner wisdom and strength for the natural birth experience that I had longed for. After the birth, she assisted me with a baby who had trouble latching as we figured out how to get my little one to breastfeed. Her peaceful presence is contagious and just what I needed to get through postpartum days as a new mother with two other children to care for. I was so grateful that she encapsulated my placenta. Those pills played a key role in returning my energy and giving me a quick and positive recovery experience. Alejandra was born to be a doula. 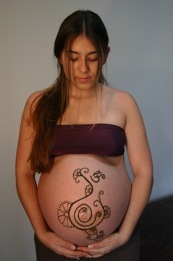 She helps every pregnant women to feel the experience as the glowing goddesses they are. “It is my pleasure to recommend Alejandra DeMaio as a birth doula. Early on in my pregnancy, my husband and I knew we wanted to hire a doula who would help us have a more natural birth experience although we would be delivering at a hospital. We interviewed four different doulas including Alejandra. Alejandra was the last doula we interviewed, and by far the best. Her warm personality put us at ease right away and unlike some of the other doulas who seemed to be bothered by all of our questions, Alejandra was open, honest, and welcoming of them. Alejandra did not disappoint. Throughout my pregnancy she was frequently in touch. She provided valuable advice and educational resources based on my areas of interest. Throughout my long labor of two days, Alejandra was constantly by my side providing soothing words of comfort, suggesting and assisting with various positions, and helping me cope when I was exhausted and wanted to give up. She also was a great support to my husband, allowing him to take breaks as needed and coaching him on how to best assist me during the long process.